For those of you interested in the history of the comics industry, and the roots of your local comics shop, I want to pass this on to you. This is a good time to share this since it connects very well with the upcoming Comic Fest, a festival that returns to the roots of Comic-Con that takes place October 19 thru 21. It inspired me to create this post and the above illustration, which you can purchase a lovely 16″ x 20″ poster of at the Comics Grinder store. Read more about Comic Fest at the San Diego Comic Fest site. My high school sweetheart was Davy Estrada. We went to San Diego State together. We got into comics. And we’d go, every week, to downtown San Diego, to Lannning’s Bookstore. Mrs. Lanning’s bookstore with the cobwebs hanging from the ceiling and all the old magazines and a shopping cart with a bin of coverless comics in it! They would have “Walt Disney’s Comics and Stories,” “Little Lulu,” things like that. And then we’d go across the street to Ye Old Magazine Shoppe and it had comics but you had to ask for them. You’d go to the front counter and you’d ask if they had any “Avengers.” And they would pull out a shopping bag and say, here’s number 17 and so on. And they all had “35 cents” written on them in crayon. We filled in all the holes in our collections. We didn’t get into Marvel until 1965. So, we had a few years of Marvels to catch up on. And, at one point, we asked if they had anything other than Marvels and they said they had this back room. There was Dell and “Magnus, Robot Fighter” and all kinds of other comics. We’d also go up to Hollywood Boulevard every six months. We’d hit Larry Edmunds, with its movie memorabilia and what evolved into Hollywood Book and Poster. But, of course, there was Burt Blum’s Inner Sanctum at the Cherokee Bookstore which was the first comics shop that we were ever familiar with because, even though it was inside a bookstore, it was an area that was totally old comics. It had bins of “25 cents, five for a dollar.” We’d get stacks this high. They tended to be the funny animal comics. When you went into his little office, you could ask, Do you have any Captain Marvel? Do you have any DC things? Do you have any Spirit comics? Do you have any Plastic Man? Then, one day, we went back there and suddenly all the bins were gone and comics were being individually priced. We knew that collecting had hit comics and there was no way we could get them for cheap anymore. We were having to pay three and four dollars for old comics. This is now 1970. Davy and I were married and we had a comics room in our little apartment. I don’t recall how I found out about it but I went to the first day of Comic-Con. I saw Ray Bradbury, Jack Kirby, Forry Ackerman. Ed Hannigan, I believe, was there representing Marvel as a fan. I recall editorial cartoons on display from the San Diego Union. I only went one day for that convention but I’ve gone to all of them. I went back every year. I wasn’t involved with the show until 1974. My Richard Alf experience is that there came a time when we sold all of our old Marvel comics that we’d bought at Lanning’s Bookstore and Ye Olde Magazine Shoppe. Richard already had his store, Comic Kingdom. We sold those comics to Richard for three dollars each! I don’t know that they’d be worth all that much today since we had constantly read them and wore them down, wrote all over them. At this time, I wasn’t yet involved with putting on the show. I was an adult working female and here were these younger guys and, older guys too, like John Hull, one of the dealers back then. Anybody who was in San Diego back then, that’s what we did: We bought new comics from the newsstands and then go to places like Lanning’s. We’d buy Ray Bradbury’s work when it first came out. We’d buy “Monsters of Filmland” from John Hull. That was the golden age of buying cool stuff. Them were the days! 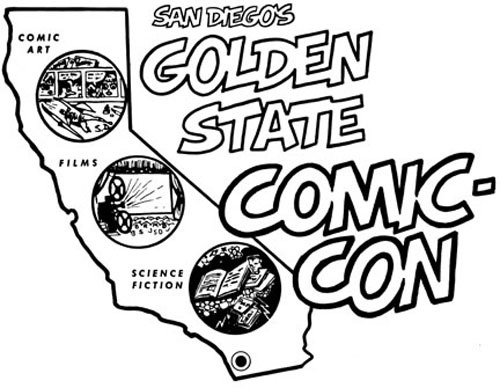 And don’t forget, if you’re in San Diego the weekend of Oct 19 – 21, go out to Comic Fest! In 1967 I’d buy coverless comics at Lannings for two cents each, roll up three in newspaper, take them to school in my American Airlines flight bag, and sell them for .25. I was making ten bucks a week, but it nearly got me suspended from La Mesa Junior High. I purchased my first Golden age comics from John Hull, usually in the $2.50 to $3.50 range. I bought from him often in his garage-store. He lived on Gotham Street, which I took as a divine omen. Mr. Hull sold me my Buck Rogers Atomic pistol with the box which I still have 50 years later; ($25 of Lanning comic sales money). Road trips to LA comic shops were a special treat. Burt at Cherokee was deeply into his hippie period. I walked out of that smoke filled loft a bit light headed, but with some great stuff including a Superman #2. Great memories from when the stuff was very hard to find and required real dedication and sleuthing. Thanks so much for your recollections! The hip kids today visit their local comics shop. We at least still have that!